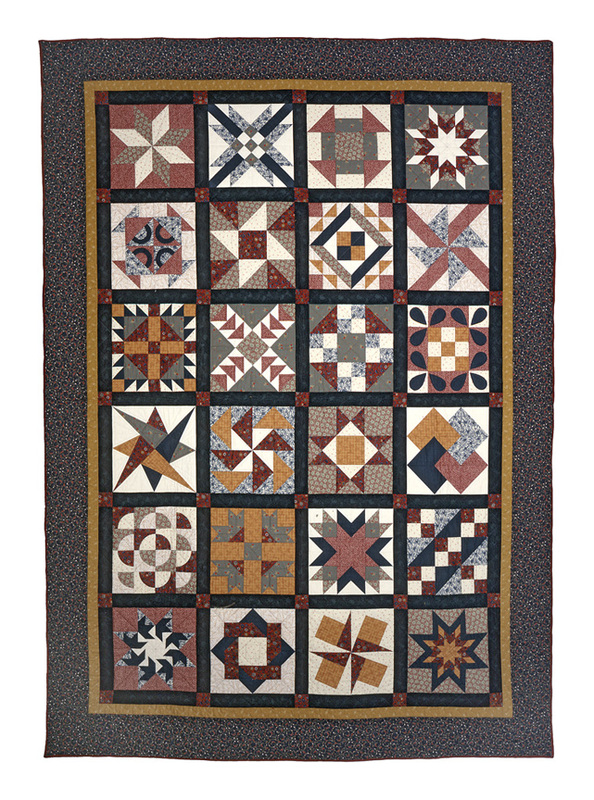 I took a hand-quilting class about 12 years ago. 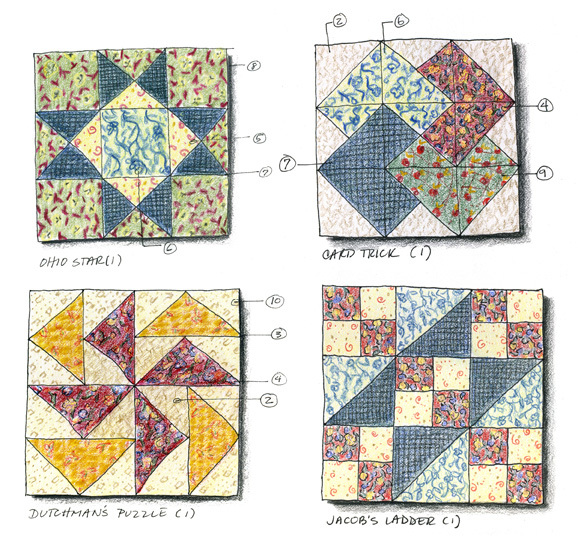 The class was several weeks long and in that time we were going to learn various methods of hand-piecing by putting together several quilt blocks to form a sampler quilt. Each week we learned different things: how to make a pattern, how to cut cloth, how to pin together our pieces, how to sew, etc. 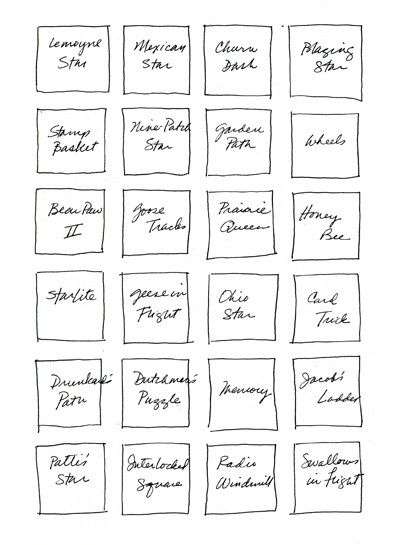 In all that time it was never suggested that we draw our quilt blocks to plan out our fabric choices. 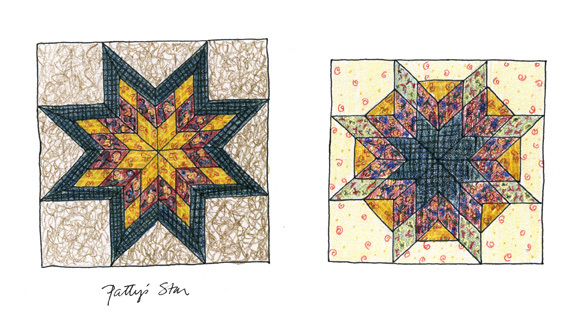 I was just so enamored to be working with such delightful patterns and colors that I drew out my squares. 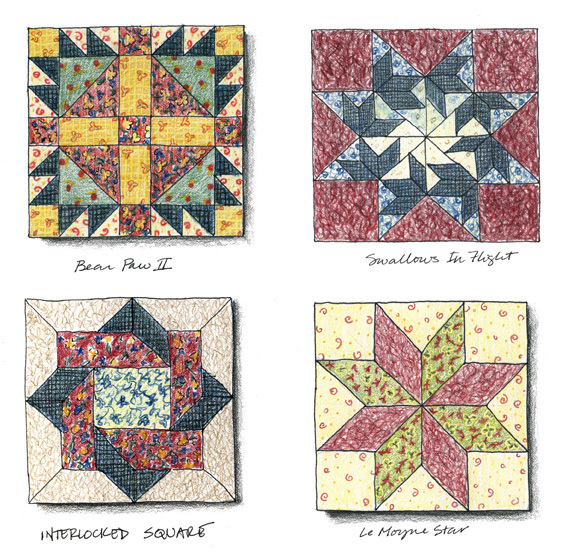 I justified the investment of time into these "quilt block portraits" as studies that would help me avoid making terrible fabric combinations. But I knew deep down that was a flimsy excuse. I just wanted to draw patterns and shapes. I wanted them to come alive on the page before I executed them in fabric. 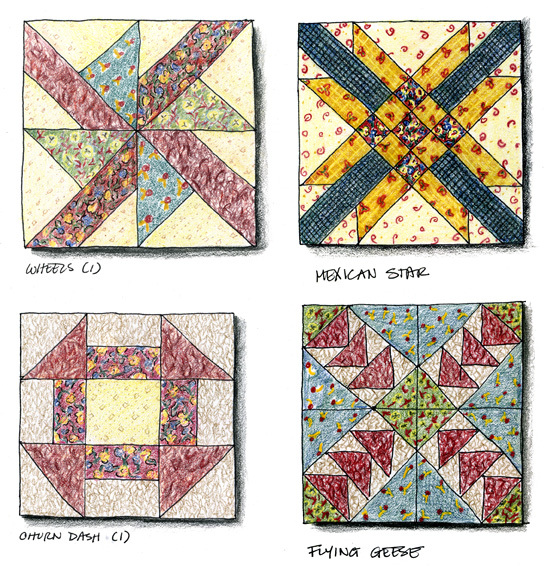 I'm including my layout plan for the quilt. I'm not all that sure that I followed the plan completely. I may have made last minute changes as I was piecing the quilt together. I thought it would only be fair to also show a photo of the completed quilt. It was almost entirely hand-sewn. I used a sewing machine to attach, and possibly make the binding. I may have also used the machine to sew the back panels together. Everything else is hand-sewn. I'm often asked why I don't use the machine more. For me hand-sewing is incredibly relaxing. Using a sewing machine feels a little too much like work. I suppose if I used the machine more often it would become second nature and I would feel less Dickensian about it. For me, the whole point of hand-sewing is there's no rush. I don't have a quota to fill or a deadline to meet. I'm doing it to do it. Which, oddly enough, is how I feel about drawing. Something in my brain feels deeply satisfied when my eyes and hands work together -- whether it's drawing, quilting, calligraphy, knitting or crocheting, the effect is similar. It's at once relaxing and stimulating -- I feel deeply calm and at the same time incredibly awake and engaged. It's as thought the act of working with my hands opens my mind to learn new things. I'm sure chemists and neuroscientists all over the world are trying to figure out how to get this feeling in pill, if not sniffable, form. It would at the very least make an interesting brain study -- to see the effects of fine handiwork on cognitive development and receptivity. Somebody should get on that.